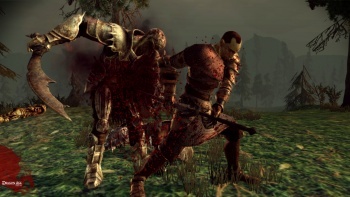 Was the day one Dragon Age: Origins DLC designed to steal your money? Not in the least, according to a BioWare designer. Dragon Age: Origins has finally been released to the public and is also really, really good, but a slight controversy still exists over the day one release of the $7 Warden's Keep DLC expansion. This expansion adds a player keep, new items, abilities, and a pretty important sounding quest that details the history of the game's Grey Wardens, but controversially also adds a storage chest that can't be gotten through any other means. The main complaint, as Tom Chick explained at Fidgit.com, is that there's a lot of stuff in Dragon Age, so a storage chest is pretty important and useful. To include it only in something that players must pay additional money for, rather than a free patch, is seen by some as a way for EA to "bilk" its customers of more money. Chick's article attracted a response from Georg Zoeller, the Lead Systems Designer at BioWare. Said Zeoller, "I categorically reject that any features or game systems in this game were designed or removed to 'bilk users for more money.'" According to Zeoller, the player's inventory limit was never questioned during any phase of the game's development, and was added by the DLC team as a "cool feature for your own keep"; EA had nothing to do with the contents of the Warden's Keep DLC. A storage chest was implemented at one point, but players were losing their items due to the camp area constantly changing, admits Zoeller, and there wasn't enough time to fix this problem. Warden's Keep provided a permanent and central location for a storage chest to reside. While I fully believe Zoeller, I also have to agree with Tom. Not only because we both have the same name, but because a storage chest in a game with tons of items is such a must have that I can't imagine a company like BioWare not thinking that it would be important. The storage chest in general has evolved over time since its notable appearance in Diablo, sometimes even allowing us to share items between different saves. So, a universal storage chest that has the same items no matter where you access it from is not exactly a new idea, and I'm curious why BioWare wasn't able to implement one while they had the original idea, rather than scrapping the item entirely. More likely than not, there was no intentional foul play on anyone's part, with more than storage chests on the mind of BioWare as it developed Dragon Age: Origins. Regardless, day one DLC that must be paid for will likely continue to cause frustration in the future, especially when it includes aspects that can improve the play experience.